How to become a Microsoft MVP - Most Valuable Professional? ‘How do I become an MVP?’ is one question which keeps ringing in most of our minds. Quite a few of you had also sent me an email asking the same. Well, I must agree that the awareness of the MVP program is less among the tech folks. Let me start explaning.. The thoughts which are mentioned in this article are just my understandings about the program, being an MVP for few years! Update: 9th March 2016: Microsoft plans to shuffle up the MVP program, and its for good! – Read more here. First of all, Most Valuable Professional (MVP) is not a certification., Its an Award! – Its a mode of recognition which Microsoft gives for individuals who are technology experts and most importantly, who play a role and are keen in sharing their expertise with the Community. So if your question is, “I have completed my MCTS or MCAD.. what are the next steps towards being a MVP?” – You must re-think on your question.! MVP awards are usually given every quarter and it’s an annual award, which means that your award is valid only for a year. At the end of the year, your contributions of the previous 12 months undergoes a strict validation process before you are awarded again. MVP awards are given in various categories and technologies. The product teams in Microsoft evaluate your expertise and contributions; Once they feel, your contributions are vital and important.., you are awarded an MVP! MVPs are definitely not a part of Microsoft. MVPs are independent of Microsoft, with separate opinions and perspectives, and are able to represent the views of the community members. I would recommend, Identify your strong technology and work towards it. As I mentioned earlier, being a Tech expert is one of the important parameters. Let me not comment or give you ideas on how to improve on that. However, I would like to emphasize on other factors which you can work on.! Sharing Knowledge – Is one important ‘Mantra’ for being an MVP. As far as I have seen, people choose any of these below methods to share their expertise. 1. Technical Forums – This is one of the most common places where a lot of people discuss about technology. It can be on Issues, Current Trends, Cutting Edge Technologies, Queries etc.. Contributing in this portal always has an edge; as you know that, the solution which you provide is validated and implemented. You also get a chance to solve real world scenarios and problems. There are many Tech Forums, but notables ones are MSDN, TechNet, Appdeploy, Windows Club, Neowin etc.. I would recommend, you take part in these discussions, provide solutions to people and gain a good online presence. You can also choose to play a role in filing bugs and fixes in Microsoft Connect website. 2. Blogs / Website – I don’t need to explain the significance of having a blog, as most of you know how important medium it is. However, one point which I would like to emphasize here is – Blogging is not just mere sharing your thoughts / comments. You should also be concentrating in providing solutions to people like writing a code snippet, How To Articles, Technology Reviews, Case Studies, Design Solutions etc. This will help in valuing your expertise. Also, It’s always good to have your own blog. However, if you are not keen on maintaining one, you can also choose to write on some popular portals. This way, you can ensure that.. your solution reaches those developers / IT Pros / Consumers who are looking for information! The points discussed above mostly concentrates on your online presence. However, if you do not want to be an online person, UG Communities is the way. 3. 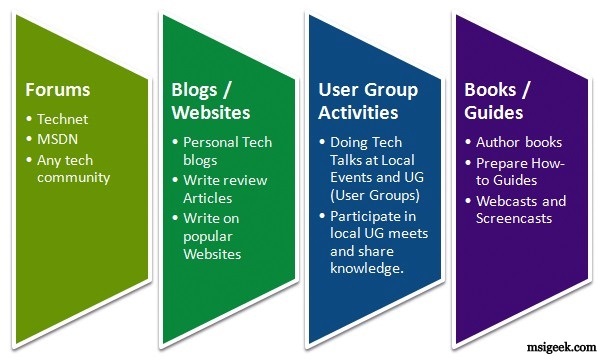 User Group Communities – User groups are typically independently run, volunteer groups that meet on a regular basis to discuss and share information on a variety of technical topics. Participation in a user group is an excellent, inexpensive way to receive technical content, education and to meet with your peers to get more out of the Microsoft platforms, products, technologies, and resources which you are interested in. Most of the cities have an User Group Community which does regular meets, sessions and events covering various technologies. In Bangalore, we do have BDotnet and BITPro which are one of the top UG communities in India. I would recommend, Identify the Local User Group in your city, (..and if you do not have.. you can indeed start one too.! ) You can contribute by taking sessions on Technology Concepts, Productivity Tips etc. Also participate in regular discussion meets and share your ideas and experiences. This will help you go gain an offline presence in the community. 4. Books / Guides – There are very few people who write and author books. This needs great expertise in technology and you should know the right approach in writing the same. If you are skilled in it, contact any of the publishers and write a proposal on what technology can you write on. You can also prepare How to Guides, Author White Papers, Podcasts and Screencasts. These materials can help a lot of people, who are in need for guidances. These are just few contributions which i can think of; if you have any other approach towards sharing knowledge.. thats appreciated too! The moment you feel, your presence among the community is valued and many people are benefited from your solutions, you can apply for the MVP program. You can choose to submit the nominations yourself or even send it across to an MVP who can pass your nominations to his lead.! Though the award, memento, certificate and the recognition itself is a biggest asset, you do get some nice benefits from this program once you are an MVP. Following is a brief introduction to them. I would also put across my experiences which I had. 1. MVP Open Day (Depends on your region) and Global Summit – You are exclusively invited to meets like this, where you get an oppurtunity to learn and connect with lot of like minds. You also get a chance to interact with the Microsoft Product Teams and they are really interested in taking your feedback about their products. Also, you are involved in various discussions about their future products and technologies. Also, I had this opportunity to discuss with lot of other bloggers /Experts like Amit, Pinal, Suprotim, Anand, Ramesh etc.. This below picture was taken during the South Asia MVP Open Day, which was held at Microsoft IDC. Summing up, Networking and meeting people is one great benefit being an MVP.! 2. First hand Access: Being an MVP, you do get access to first hand information and Technical previews of softwares. 3. MSDN/ Tech Net Subscriptions: MVPs are given one-year online priority access to products and expert advice. There are also few other softwares which you get as a part of the 3rd Party Offers. 4. MVP Product Group Interaction (PGI) Feedback – allows MVPs a direct channel to submit comments, suggestions, and reports of abnormal behavior or potential viruses related to Microsoft products and technologies through the MVP Member’s Web site. 5. MVP Private Newsgroups / Discussion Lists – This provides forums for MVPs from around the world to share ideas on Microsoft products and technologies with fellow MVPs and Microsoft employees. You also get access to virtual learning center delivers timely instructor-led online courses that help Microsoft MVPs gain more knowledge. 6. Being Valued – This is something which i found really impressive. Being an MVP from past 2 years, i did get an opportunity to attend various technical conferences like Tech-Ed. One point to mention is, during both the Tech-ed events (Hyderabad ’09 and Bangalore ’10), MVPs were given free entry to this event and to add, we had 2 Rows Seats Reserved for us. We are sitting right in front during the Keynotes. This was a “aaha” moment for most of us. I did take this below picture during the last Teched., where I was watching Soma Segar giving his keynote address and launch Visual Studio 2010. These were few of the benefits which I got being an MVP. There are many more recognitions which you get. Keeping it simple, you are valued for the contributions you make..! If you have made some kind of contributions and you think, you deserve this award; apply for this award now. You can also contact me, and I will pass your nominations to my lead. I had also posted this on LinkedIn Discussions and have got some quality responses for the same – I will extract some information from there and post it here so that, you can get all the information at one single place. “I started working with the CRM 1.0 Beta. The deployment instructions were not very clear and after all it was a beta. But I figured out how to get it all working in the forest and solved a problem that I thought folks could be helped by knowing about it. So I posted it on a brand new NNTP based news group and wrote a Reader to Reader Article for Windows IT Pro magazine about it. I got really good responses from it and peope asked me where I read about the fix. I didn’t, I deduced it from the behavior and my experience with AD. Thus I saw how much joy came from helping people. I also learned more by solving problems with this new product at the time. I kept on talking and blogging about it and one day I got the email and then the letter. It was a great honor and surprise. It’s been an honor every since because I’m in a community that wants to help people. Also it’s in my best interest that the technology be adopted so my work experience can be of value in the market. So why not help people? There really is more joy in giving than in receiving. It’s also great to have Microsoft’s appreciation for our advocating their solutions. I worked for years on other platforms and I still recommend Micosoft Solutions for clients as opposed to others. Now being an MVP helps me bring even more value to my clients.” – Curt Spanburgh, Microsoft Dynamics CRM MVP/Contributing Editor Windows IT Pro Mag. Posted in Community Activities, General, How-to, Microsoft and tagged award, howto, MVP. Bookmark the permalink. I have noticed that many try to 'work towards' getting the MVP Award. I dont think it works – there are no shortcuts ! Microsoft sees a persons last 12 months community participation and decides to award outstanding leaders the MVP Award. So my advice to all – forget about the MVP Award; just blog or participate in communtinty activities! If you do it from your heart with a passion; the MVP award will come walking to you! Well said Anand.! Can't agree more with you.! just a quick note.. MVP is an award, not a job (although one could call it an unpaid internship) Most MVPs I have dealt with through contact in forums and user groups and the experience is mostly positive. You get the award through sharing of knowledge, basically geeking out with fellow geeks and something you can do for hours on end. As such demanding answers or help isn’t always the best approach. I work with SharePoint a lot, it’s a passion that shows up in my blog countless times, but we are all human and you could just catch someone on a bad day or when life gets in the way. Apart from there, I am participating in solving problems related to computers and internet on Yahoo Answers. The initiative which I started almost 2 years ago, one best think which I got that many of the answers were selected as “best answers” among other. So, why did I selected Yahoo Answers- Because when you will see the demographics most of the internet users post their problem and questions here to get solution immediately. Don't know where the team at MS will consider it as contribution towards community or not, but I feel that it is also a form of providing help to those who needed it. Sure Ankit. You are right. The quality of the solution is considered than where you post it. So there is nothing for you to worry on! IMO the short answer is you don’t. Microsoft tends to give MVP’s out in either emerging markets or emerging technologies. I’ve been doing all the things that you mention for 7 years and the feedback I’ve received was “Oh I thought you support InstallShield technologies.” I’m not upset (anymore) though… getting an MVP at this point in my career really wouldn’t mean much to me other then marketing swag. Hey VJ – Nice article and well put together. Becoming and Being an MVP you have shared that experience as well. Lot of people have a misconception that MVP is just another certification. Agree with the fact that one should work towards sharing the information and helping the folks with best practices.. and the MVP award is just the recognition for it. And the benefits as mentioned is huge!! Thank VJ for this awesome info. Well I agree with you Chris. You are bang on Nail. I have always felt that, the preferences for the MVP award was given to the Products and not Technologies. However, when I got this award for Setup and Deployment, my primary contributions towards the community was on Wise Package Studio. I reckon, thats where the focus changed to Technology. It could also be because of the region I come in from. Let me be honest, You are much above the benchmark of an MVP. If I need to quote the top 10 people in the Windows Installer technology, you will be right on the Top in my mind..! Its not a flatter.. but just the fact.Your contributions and perspectives towards the technology is phenomenal and there is absolutely no doubt in it. If MS has not regarded your contributions in the past, its MS who has lost badly..! That's what ! If you try for it you can never get it. But if you keep on contributing you unkowlingly you get it . Being an MVP from the past 5 years , my life has changed a lot. Nice post. Indeed very useful. Thanks for a wonderful write-up Vj. I didn't come across such a conspicuous article on MVP in detail till now. Great work! Absolutely correct! I totally agree with Anand's words. Same thought instantiated in my mind few weeks back. The passion for sharing should be something from the bottom of one's heart. And MVP is a token of recognition. As Hima said, It should 'surprise' us. But, we should NOT work or WAIT for it! This is what I learned from my little experience. Thanks for your kind remarks. I have strong convictions and I don't mind speaking out when I agree or disagree with someone or something. I offer no apologies and have no regrets and will continue to have a passion for Setup and helping others. Wonderful article, and very immence explaination you provided here. I’d say YES, its all about passion of yours towards the community contribution. 1)I think that i have knowledge about the latest technologies of todays but i don’t know how to showcase my knowledge,please tell me how to do so,and how is it going to help me be an MVP. MVP program is only for friends of people who work at Microsoft. Come to Australia and you'll see an example. Thats sad to hear John. Looks something is wrong somewhere and its needs to be flagged. Whenever you feel that, you are competent enough for applying., contact me and I shall try the best for you. I was pleasantly surprised when I got the confirmation mail from Microsoft too,I would back Anand on this, Just have the passion to reach out and help people,being an MVP or not, if you want to lend a hand then do it! Thanks vijay for sharing this information.